Scotland’s the Twilight Sad were one of the few bands that fell through the cracks and had only caught my attention late last year. If only I had encountered them sooner, the band would’ve felt right at home in my top 2007 list. Although on second thought, I might have to rethink that. The songs are epic sculptures of sorrow and sadness that’s designed to fill huge spaces, and even equipped with song titles that’s not afraid of going too far or just being ridiculously long, such as ‘And She Would Darken The Memory Of Youth’, or ‘Last Year's Rain Didn't Fall Quite So Hard’, and ‘But When She Left, Gone Was The Glow’ and not forgetting ‘That Summer, At Home I Had Become the Invisible Boy’. But these tunes comes attached with remarkable sweeping, soundscapes, and one that’s not overtly intense as they’re more gracefully dramatic, while inflected with vocalist James Graham’s Scottish drawls, adding a foreign charm to otherwise familiar arena-filler music. 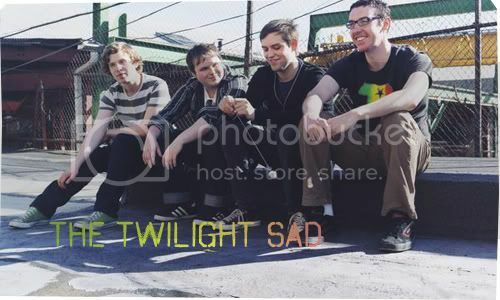 The Twilight Sad developed their music through a wide range of instruments, including the basic guitar, bass, and drums to the not so basic, such as the theremin, toy keyboards, and thumb pianos before falling into their own signature sound. Music is sparse on ‘That Summer, At Home…’, but the sounds are beautiful and sublime, a congregation of soaring melodies, that gradually builds up and grows denser prior to bursting into an upwards surging flare of distortion, creating a spectacular sight. And on top of that, the song boasts lyrics that are profound and affecting; because not just any kind of music can be paired with lines that go: the kids are on fire / in the bedroom. A little disturbing maybe, but the music, has to be real epic right?